I love Amazon. My husband and I have been Amazon Prime members since its conception. It has saved us so much over the last few years. If you’re a Prime member and shop Amazon often like us, you know exactly what a great deal this is. FYI, there are affiliate links below, and if you click on one and try out this incredible offer, I will earn a little money. So, thank you. When I heard about Amazon Family, I had to share it with YOU! Because when I find a really good deal I want to share it with others. 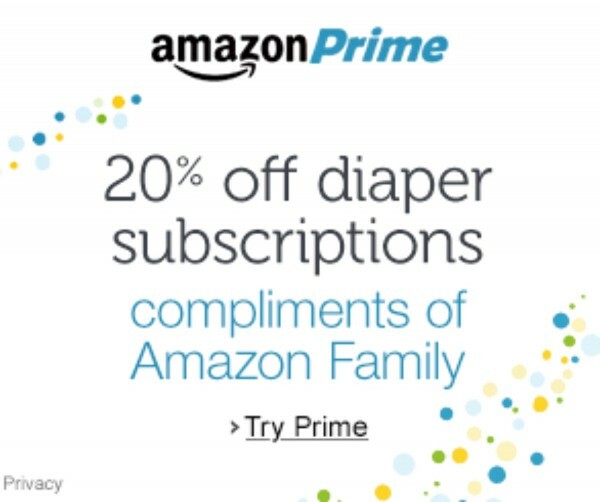 You save 20% on diapers subscriptions – If you have babies in diapers or expecting a new baby, this is an amazing deal. Exclusive Coupons and Deals from Amazon Family – You can find great prices on Amazon, but getting even more great deals and coupons to save even more money is an even better deal. Exclusive Baby Registry benefits – If you are pregnant or trying to get pregnant, the baby registry benefits a deal you don’t want to miss. FREE Two-Day Shipping on millions of items – As I mentioned, I’m a Prime member and the free shipping has saved us hundreds… no, I’d say, easily over a thousand+ on shipping alone. Unlimited instant streaming of thousands of movies and TV shows – I love instant streaming! If you haven’t watched “The Man in the High Tower” yet, I highly recommend it. Unlimited, ad-free streaming of over a million songs and more Prime benefits. We are huge music lovers in our home. We are so taking advantage of the music streaming. This is a MUST-HAVE for families. And right now… You can join Amazon Family for a 30-day FREE trial. Now that’s a deal you can’t pass up. So if you don’t have Amazon Prime, try Amazon Family for 30 days and see for yourself how awesome it is. It’s a win-win! So HURRY and don’t miss out on this incredible DEAL! If my boys were young I’d jump on this but gonna share with my friends with babies. I love prime. Now my husband is hooked too. I love Amazon Prime. I can see why Amazon Family would be good for those with kids. I will definitely be checking this out. Thank you for sharing and Happy 2017! This is a great deal. I sure wish I needed diapers, lol. Thanks for posting! I use my Amazon Prime often. I like the 2 day free shipping. Amazon Prime is the best! it pays for itself.